Do you know what happens to the salmon the Pike Place Fish Market fishmongers use in their world-famous tossing demonstrations after all the high-flying action is done? 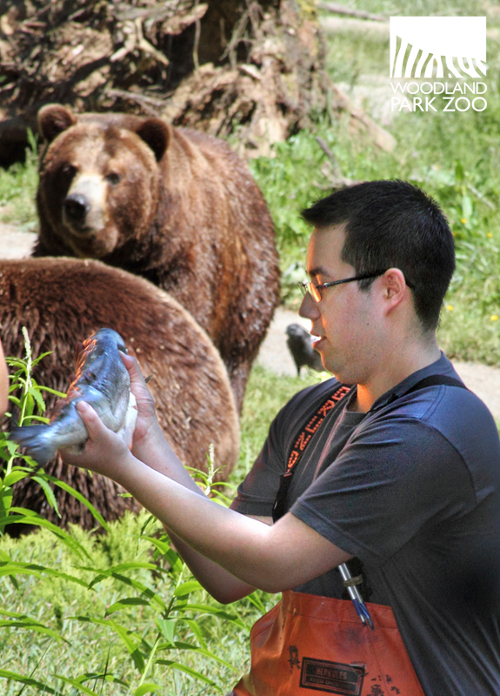 It becomes food for Woodland Park Zoo’s two grizzly bear brothers, Keema and Denali. 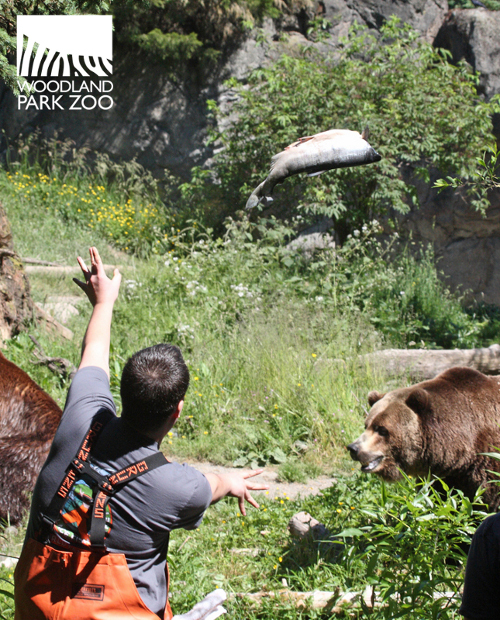 This week, that fish was hand delivered to the bears by the fishmongers themselves in a fish toss unlike any other in town! The fishmongers came out for the special toss to help us promote this weekend’s Bear Affair: Pacific Northwest Conservation presented by Brown Bear Car Wash event, coming up on Sat., June 8. The sight of fish being hurled through the air during some early practice tosses drew a crowd, and soon the exhibit was packed with visitors waiting to see the real deal. The bears caught the scent of the fish and, seeing all the action, situated themselves perfectly on the other side of the moat awaiting their meal. The salmon toss is a great way to reconnect Northwesterners with some of the icons of local wildlife. Brown bears are so closely linked with salmon runs in Alaska, and here too before they were extirpated from most of the Pacific Northwest. Eating salmon is in their natural history and is one of their favorite snacks, especially this time of the year when they are beefing up and craving protein. The bears will tear into more than just fish on Sat., June 8 when we set up a kayaker’s campsite (11:00 a.m.) and backyard birthday party (2:00 p.m.) for them to explore during Bear Affair. The bear pair will demonstrate what kind of trouble follows when food, gear and garbage aren’t stored properly. Bear ecologist and conservationist Chris Morgan and zoo staff will help make you more bear aware to avoid catastrophe in bear country. The celebration of Northwest wildlife continues with representatives from Western Wildlife Outreach, Wolf Haven International, Methow Salmon Recovery Foundation and zoo experts giving talks and presentations throughout the day. Other activities include Karelian bear dog demonstrations that highlight how the Washington Department of Fish and Wildlife partner dogs play an essential role in training nuisance bears to avoid human contact, safety camping tips by Boy Scouts, and more. If you can’t make the event, be sure to watch the bear demonstrations at 11:00 a.m. and 2:00 p.m. live at http://www.ustream.tv/woodlandparkzoo, when the Bear Cam returns online to stream the action right to your home or mobile device.